At the risk of sounding like a commercial, I love Findaway World, a privately-held company established in June 2004 . They are the innovative folks who developed self-contained pre-recorded audio and video books for libraries, schools and the military. Their mission is to simplify technology and create products that provide immediate access to content. They even sound like geekie librarians!!!! 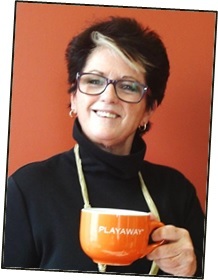 Findaway World also has a new video product called PlayawayView, which are self-contained videos for adults and kids. In Guelph (a community of 123,000 in southwestern Ontario) they are steadily growing in popularity, particularly with the K-to grade 4 group, folks who travel, and seniors in hospital. We have 300 View titles and a standing order for 16 new titles per month. Our most popular kid’s View title is Sid the Science Kid: Weather, which is no surprise to me as Canadians are weather crazy!! At a cost of $99 and with 13 circulations in 3 months, I anticipate Sid will have a a lifetime circulation of 80 – 125 or less than $1/use over 2 years. I consider this a good return on investment, as the average book return on investment is approximately $1.10 over 27 circulations. ● and of course the National Geographic titles are huge with all ages. But, what interests me most is Findaway World’s innovate marketing. The first hint comes from their Circulation Station website which is interactive and rich with content and support. They understand libraries and our limited budgets, so there are great do-it-yourself resources. But, they are also constantly on the lookout for new innovative marketing ideas. For example, last month instead of a Findaway Library Advisory Board meeting, they sent us all a thank you and a link to a downloadable Starbucks coupon for a free coffee on them! What a great idea! Just think of how many ways we could use that idea to thank board members, book sale volunteers, or encouraging the great work of a staff member. Thanks Findaway World for yet another great marketing idea. Subscribe to comments with RSS	or TrackBack to 'Just another reason to love Findaway World. #19: 2013'. Thanks for sharing this background on the Playaways, Kitty. A smaller person in my house is listening to Search for Wondla via playaway AND reading along in the book. At nearly 500 pages, the book was too intimidating for a newer reader, but with the audio going along it’s accessible. Thank you.